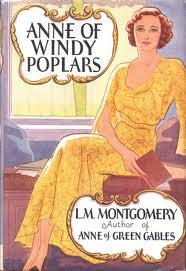 Anne of Windy Poplars is the fourth book in L.M. Montgomery's Anne series. Set during the period while Anne is principal at Summerside High School, the novel frequently takes the form of letters between Anne and Gilbert Blythe. Other than the occassional syrupy sweet passage, the book is typical of L.M. Montgomery's style of writing. The plot is almost non-existent, as she paints little vignettes of sleepy characters in a sleepy village. 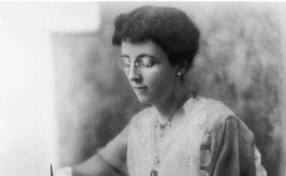 None of the characters is fully drawn, and it unfortunately contains all of my least favourite aspects of L. M. Montgomery's writing with little of the best. I had the distinct feeling that she was drawing from incidences in her own life and embellishing them for dramatic effect. It is possible that such a person as Aunt Mouser exists, but her gloom is beyond the scope of the believable. The character of Anne was not nearly as endearing as childhood Anne who loses some of her charm as she ages and seems to gain a too-perfect, idealised young professional veneer, that we never see beyond. Her youthful optimism turns to Pollyanna sweetness when she encounters "challenges" in her new role (eg. being disliked by the Pringles). Her life is a little too rosy and her previously charming faults and foibles just give her a Goody Two-Shoes aura. She charms every old biddy but fails to reveal why anyone should be charmed. The events are scattered and haphazard, giving the impression of random stories that are plunked into the plot with Anne's involvement added as an afterthought. It seemed like one of the books Montgomery wrote to satisfy publisher's greed and reader's appetites, but not from the heart. All that said, I wouldn't have missed it, if only because I, like all her contemporary eager readers would have hated not knowing what happened to Anne between those childhood years, and the years when her own children were growing up. L.M. Montgomery is strongest when writing about children and childhood.